All of the Annual Conference and Exhibition (AC&E) sponsorship opportunities are sold separately and are subject to availability. Any option with a maximum number will be handled on a first come, first served basis. The 2019 IAHSS Annual Conference & Exhibition will be held April May 19- 22 in Orlando, Florida. 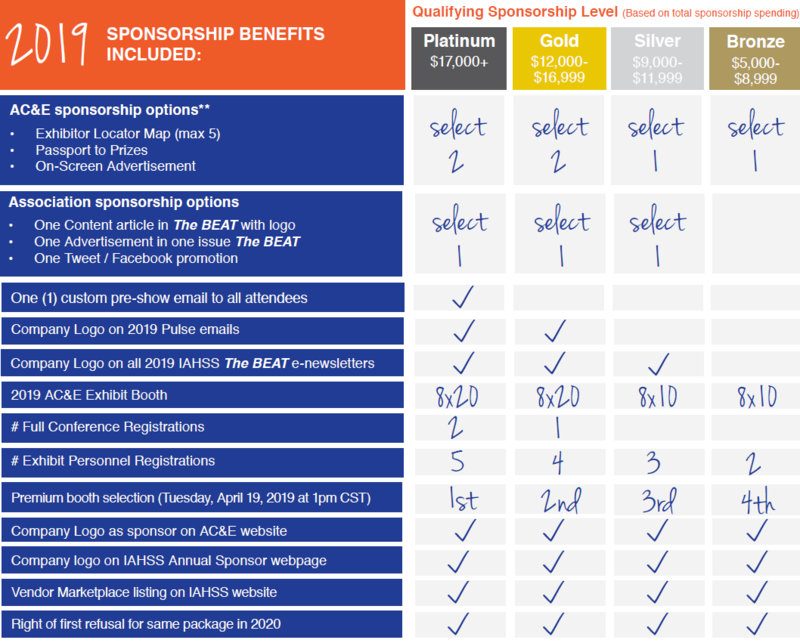 Total sponsorship spending of at least $5,000 automatically qualifies for sponsorship level benefits (see table below), including an Exhibit Booth and exhibit personnel registrations. $12,000 -- Monday Keynote Presentation (max 1) Sold out! $7,500 -- Hotel WiFi (max 1) Sold out! $5,000 -- Breakout Session Presentation (max 3) Sold out! $4,500 -- Hotel Keycard (max 1) Sold out! $3,000 -- Exhibit Hall Product Demo (max 5) Sold out! $2,000 -- Pocket-sized On-site Program - Sold out! $2,500 -- Conference Bag (max 1) - Sold out! $2,500 -- General Session Sponsor (max 6) Sold out! $1,000 -- Mobile App (max 3) Sold out! $500 -- Passport to Prizes Sold out! $500 -- On-Screen Advertisement (max 5) Sold out! $500 -- Exhibitor Locator Map Sold Out!